Slipped Disc | And the next Beethoven cycle is coming up …. And the next Beethoven cycle is coming up …. Announced today by Gianandrea Noseda and the National Symphony Orchestra, the nine symphonies will be performed over three weeks in May-June 2020. Interesting. It brings up an interesting debate as to great artists who “changed the world” (and in what way) or who didn’t change the world. In what way did Beethoven “change the world”? Yes, I know, it’s all marketing hype from the orchestra in the city of marketing hype. And are Beethoven’s symphonies the Mt. Everest of the symphonic repertoire, or Mahler’s? 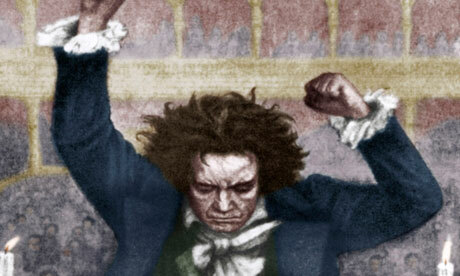 Beethoven’s third symphony was (is) truly revolutionary – as is his 9th. But so are Mahler’s 5th & 8th (and 2nd and 3rd…) Interesting. In any case, no real need for a Beethoven cycle from the NSO and Noseda. Agreed – I wish the recordings were a survey of his best work with the orchestra (maybe that’s still coming). The KC Concert Hall is also maybe not like recording in Carnegie Hall live… hopefully the engineers will do well with it. “Cycle” does arguably imply they’re recording them; I believe they’re just performing them. As are a bunch of orchestras. Actually the article (https://tinyurl.com/y9tamrr5) says they will perform and record them all over the course of 18 days. My goodness. Will there be recordings ? My sentiments exactly. That said, Maestro Noseda is a fine conductor and will no doubt give us a Beethoven cycle worth hearing. One of the most important symphonies was (is) Debussy’s La Mer, with as much influence on other composers as Beethoven had in the 19th century (a mixed blessing for most of them). Above a certain artistic level, one can no longer say: this composer is better than that one, or: this is ‘the best’ in such and such thing. So many composers of the past are in generally the same general league, and LvB does not float as the deaf saint of music above all others. A certain type of totalitarian performers – I don’t want to name names, but one of them appears to be Barenboim, and another Boulez – love to think in One Leader for All who Changes the World so that after them, music is no longer The Same – a bit like Mao Tse Tung. Especially Barenboim cultivates the hobby of treating music as an object, that can be ‘changed’ at will in the Hands of a Truly Great Leader. But Beethoven was a humanist, in spite of the bad treatment of his housekeepers and his nephew. I’m sure Beethoven would turn in his grave if he knew that his works could become instruments of cheap marketing. commerce and lazy programming. And he would find the worst of all the sad spectacle of conductors treating his symphonies as mere vehicles for a career, instead of the other way around. Sorry Stuart but there’s no comparison between Beethoven and Mahler symphonic ability. Now, I’ve nothing against the Mahler symphonies but try listening to a piano reduction of a Mahler symphony compared to a reduction of a Beethoven symphony. It’s only then that one realises how much Mahler relies on his orchestration whereas Beethoven has pure musical argument. No need to be sorry. Certainly comparisons can be made. You may put one above the other, but I don’t think that way. I certainly don’t think of symphonic works in terms of their piano reductions, which kind of defeats the intent in performance. We define Mt. Everest in different ways, which is fine. But all this gets away from the core argument of the original post. What an absurd notion. Mahler *wrote for the orchestra*. If your litmus test for a piece is how well it reduces for piano, that does away with half the repertoire. The fault lies not with Mahler but with your ability to hear and comprehend music. That is true. But it is also a matter of style, and the question is whether the orchestration is part of the work or not, and if so, to which extent. The classical style is almost complete in terms of notes, and the scoring is meant to enhance the musical narrative in terms of notes. With later music, colour becomes more important. At the end of the trajectory, the meaning of the notes disappears and colour is the only thing left. Sibelius, not so much Mahler, changed he symphonic world. Beethoven too. Then there’s that Mozart guy who changed opera. I am a great lover of Beethoven’s music but why can’t these guys think about what they say. Beethoven didn’t change the world – he may have changed music but not the world. And neither did Da Vinci and Dante either. (a) Does the world need a Beethoven cycle from every orchestra & conductor capable of putting one on, even if it’s really good? Clearly not. Beethoven is doing just fine, and there has never been a shortage of performances. (b) On the other hand, nobody is required to attend, or to attend an entire cycle. Of those who do wish to attend an entire cycle, very few will have the opportunity to hear more than one. So we like to gripe & groan about Beethoven overload, but really nobody (except possibly musicians, and of course poor Beethoven himself) is actually being overloaded. Real innovative programming that is. But probably better than another performance of Rossini’s mass or the Pines of Rome by JA Noseda. No doubt the major orchestras need some rethinking about their music leadership if they want to survive for another generation. You underestimate the appetite of the audiences for mainstream food. They certainly like their Schnitzel and Pizza, albeit in good quality. Gourmet restaurants, offering surprises and invitations to explore do not have it so easy than a simple but great and bustling pizza place. Will anyone bother to program the delightful Choral Fantasia? The Creatures of Prometheus? Egmont? Fidelio, the greatest appeal against repressive dictators? Tush, nay, what would these be… to people who think the Fifth Symphony was written by an adorable musical dog? Did he actually say”change the world “I suppose it will be a year of this type of idiotic comment. Beethoven’s music was so far-reaching and influential that I don’t consider it absurd to say it changed the world to an extent and certainly made it a better (or less awful) place. Fine. But obsessively continuing to program the same repertoire over and over again at the expense of new things makes the world the same instead of changing it. I’m pretty sure old Ludwig himself would agree. The worst news of the season might be Lang Lang playing the Goldberg variations. Well, it’s not like there is Beethoven’s 250th birthday coming up or anything. I mean, no reason for a decent journalist to mention that to the masses, why Beethoven cycles are attempted in 2020, right? Nice try by Maestro, to make the majority of artists who actually changed the world Italian. Two Italians, one German. Hehe. If somehow we could enact a five-year ban on Beethoven cycles…. Make it a five-decade ban and I’m with you. Nobody is forcing you to attend the concerts or buy the recordings. It’s called “freedom”. Freedom is so 20th century. Now it’s “make *my* ignorance great again” everywhere! For real, a freedom seeking mind is a curious mind. Have a look around your social circles. How many people are genuinely curious, and how many are on the other hand opinionated ignorants? A constant tension exists between the jaded classical music fans and the larger public which is more receptive to a Beethoven cycle. The cycles serve a need, not my need but that of the larger public and of the orchestras that desire to please a large audience. Why do the jaded classical music fans have a problem with that? It’s a good thing lots of people want to experience a Beethoven cycle in the twenty-first century! Beethoven certainly changed the musical world: unlike (say Haydn) he demanded personal respect and to be treated as the artist he was. I think a good case can also be made for Mozart (first opera in German), and Sibelius. I think the 5th by Sibelius is better than Beethoven’s. While the Sibelius may be “better” than Beethoven (but better at what? ), it is just plain silly to deny Beethoven as the most influential symphonist there has ever been. The fact we have orchestras at all is largely due to Beethoven (they came into existence largely to play his symphonies; later symphonies would not have been written without these orchestras).